How often should I clean my pet’s bowls? The reason for the frequent cleaning is to prevent bacteria from accumulating. This is particularly important if you feed wet food, but the bowls for dry food should be washed too. Canned pet food shouldn’t be left out for longer than two to four hours, and any unused canned food to be saved for later should be put in the fridge. 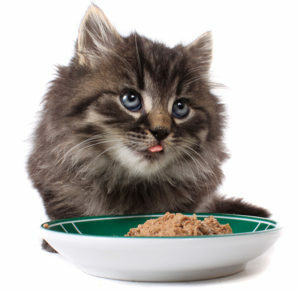 Dry pet food can be left out longer, but exactly how long depends on the brand. Even if the kibble doesn’t go bad, it becomes stale and unappealing, just like crackers we humans eat. Also consider how you store your pet food. Unopened cans should be stored at room temperature, away from heat and humidity. Dry food does well stored in the original packaging. If it doesn’t re-seal, fold the bag securely to allow as little air as possible. If you store pet food in a plastic container, make sure it’s washed and completely dry before you add new food. It’s a good idea to place the whole original bag in the container – pet food bags are designed to maintain the food fresh for as long as possible.